My optimism disappeared as the Chinese water torture started at 3am on Saturday 7th July 2012. Drip, drip, drip – cold water on my nice warm head! Something was very wrong. But to get the full story, I have to rewind to the previous Thursday. 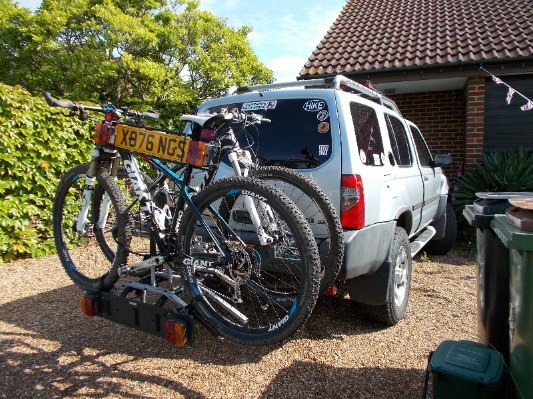 We had packed the Xterra in the sun on the Thursday morning before we headed down to Newnham Park, Plympton for the 2012 edition of Twentyfour12 mountain bike race. 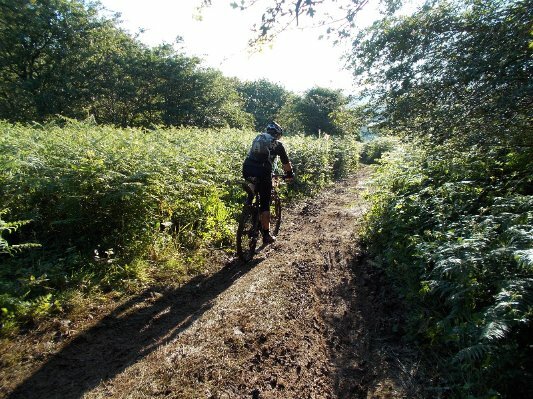 Due to the potential of poor conditions (the forecast was for some heavy downpours), we opted to take 2 bikes each: a 29er and a 26er (the latter was set up for muddy conditions). We were also packing 70 litres of beer for the social event on the Friday night – 20L Surrey Hills’ Shere Drop and 50L Darkstar Hophead and APA. Back to South Brent, back onto the A38, off at a junction 5 miles later, another sign to Lutton … OK … so there are 2 Lutton’s within a 10 mile radius! The Mountain Inn was well worth the detour. Great beer and excellent home cooked food. 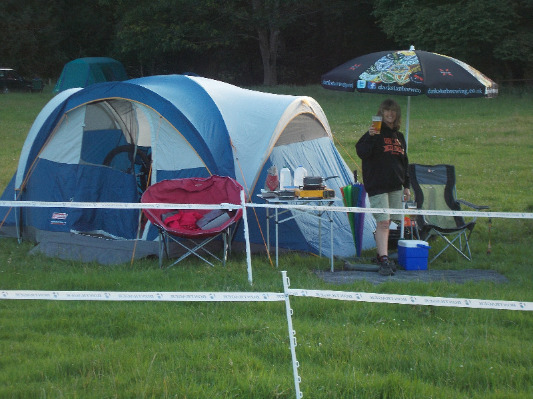 Once at Newnham Park, we put up the tent in the late afternoon sunshine. Everything was peace and calm – literally, the calm before the storm! On the Friday morning, we went for a walk around the course and were pleased that some of our favourite sections had remained. Some sections had to be removed due to minor tree interuptions - I'm sure I could jump that - NOT!! 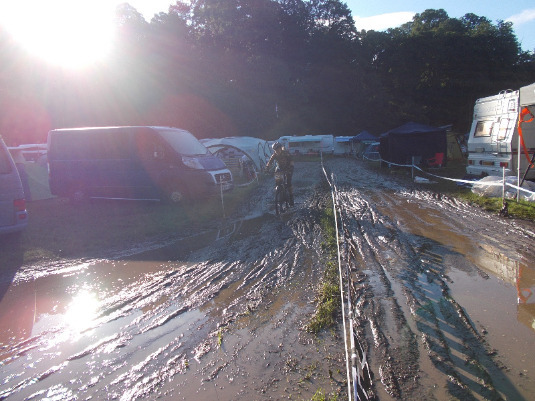 The campsite began to fill and there were mutterings that the weather forecast for the weekend was changing – and not for the better. My heart sank when, in the middle of serving the beer and cheese to the thirsty, appreciative campers/competitors, we were told that a red flood warning had been issued for the early hours of Saturday morning. 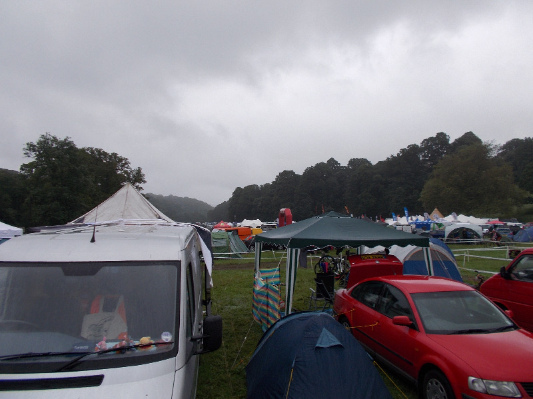 The drizzle turned to heavier rain as beer and cheese was finished off. We retired for the night. In the early hours of Saturday morning, something was not right. Rain water was dripping through the tent and onto my head. I put my hand out from my sleeping bag and felt the floor of the tent. It was like a waterbed from the puddle that had formed in the campsite. Further exploration with my hand discovered that all of the clothes on my side of the tent were wet from the rain which was now leaking in. Luckily, Tumbleweed was sitting on top of the clothes and was still dry. My mobile phone had not fared so well. I took it apart and got most of the water out of it. It didn’t work though! Roy had woken up by this time and we cleared everything off the floor and covered things up with bin liners to keep the water off. I heard voices and saw lights flashing from outside – we weren’t the only folks awake. The rain appeared to stop for a few moments and all was calm. Suddenly there was a massive gust of wind and I feared for the tent. It passed but the rain started again, just as heavy as before. We settled back to try to get some sleep – there was not much we could do until it was light. I slept with my phone on my ribs (to dry out) and Tumbleweed tucked into my sleeping bag (so he didn’t get wet). 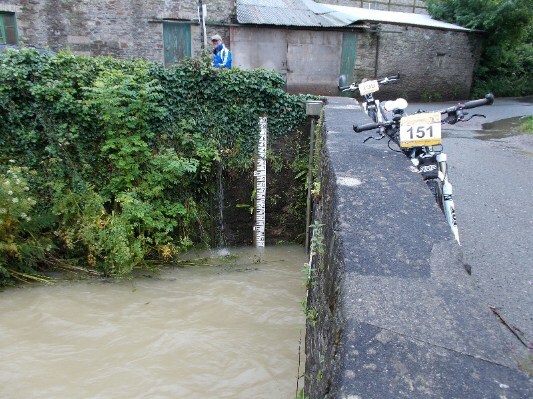 Just when Martyn Salt should have been having a restful weekend away from his Olympic duties, it turned out that he had spent a lot of the night watching flood water rising under the bridge at the end of the campsite. 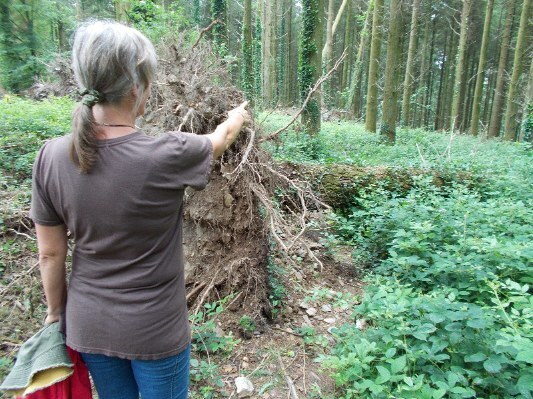 It had been a close thing whether total evacuation of the campsite was required. 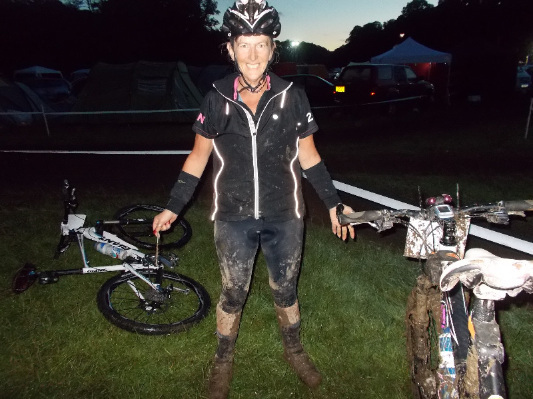 It was still raining in the morning and I was actually pleased that our race did not start until midnight. There was talk of a mini tornado which had tossed the Cycle Surgery Easy-ups up into the air and deposited them in the middle of the arena. It had left the ones on either side (Clif Bar & Whackjob) totally untouched. 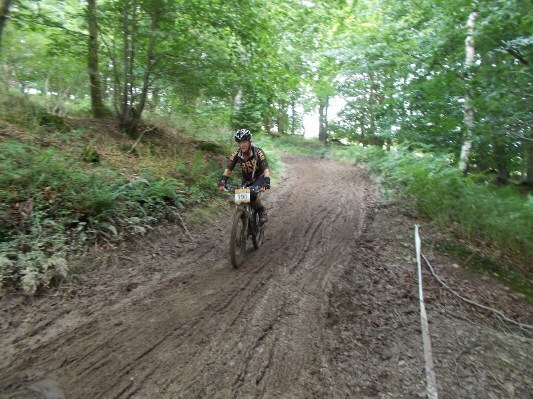 All too soon, a mountain bike race broke out! This was thanks to all of the hard work by all involved and a great group of marshals that checked we were safe on the course. Previously Roy and I have competed in the 24 hour mixed pair category but this year we wanted to try something different. There was a 12 hour race that started at mid-day and another that started at mid-night – also known as Torchbearer. The latter was only open to solo riders, so we were pitted against each other. One of the major problems for starting half way into a race is that the course conditions can be significantly different from the practice laps. 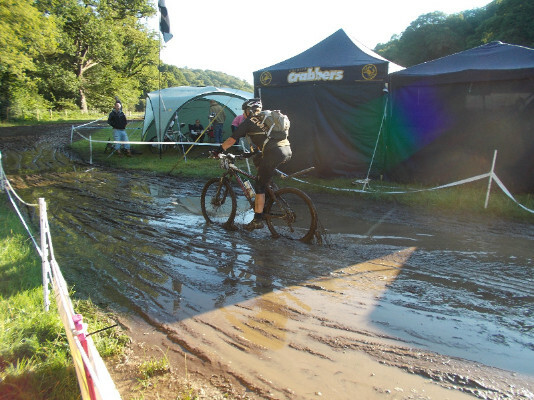 Add to this the post storm conditions and the Commissaire, Jude, having the courage to cut sections out as they became unusable, and the course had changed a lot. Although the day seemed to drag, all too soon it was time for us to start racing. My first lap was awful. 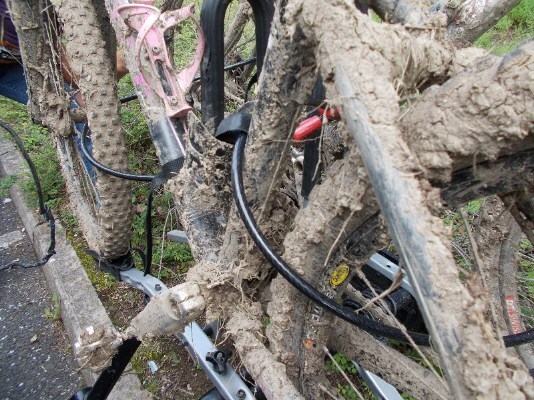 The 29er was not the best bike to use. 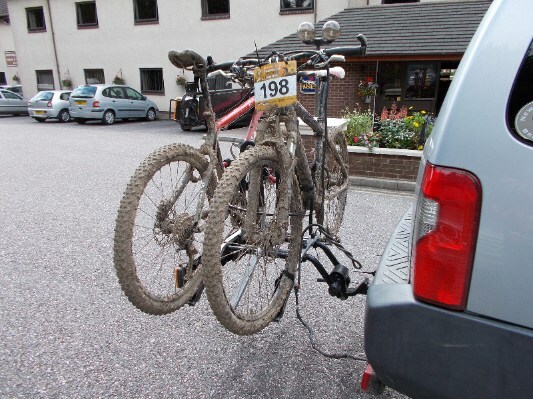 The lack of clearance for key parts meant that the mud readily clogged the bike making it feel double it in weight. Forward progress was almost impossible – 10 paces forward, 1 pace back to unclog the mud. By the end of the lap I was sweating profusely from the effort it was taking me. Swapping bikes to the 26” with Trailraker mud tyres, made a huge difference and I actually managed to ride a lot of the course. Lap 2 was complete and I was certain that in daylight, things would be much better and I could see things a lot more clearly. 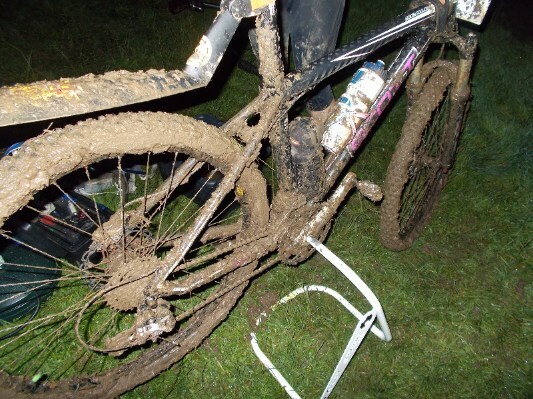 I stopped in the pit to clean my bike of some of the accumulated mud. Error!! My clothes were soaking wet and I was losing heat from my body at a rapid rate. Soon I couldn’t take any more and retired to the tent and changed out of my wet top. Climbing inside the sleeping bag didn’t help – I was so cold and heading towards a state of hypothermia. My shorts and sodden socks were off as well. I was praying that the sun would rise soon and might provide some added heat. Roy came back from the caterers with a cup of tea with the news that the class leader was on 2 laps so if I got a wriggle on I might be able to get a jump on her. Pushing the cold aside, I togged up and got ready to get back out. I then did 2 more laps on the bounce – not the quickest but at least I was moving forward. I could see the track and was able to ride more and more. It did, however, change each lap. 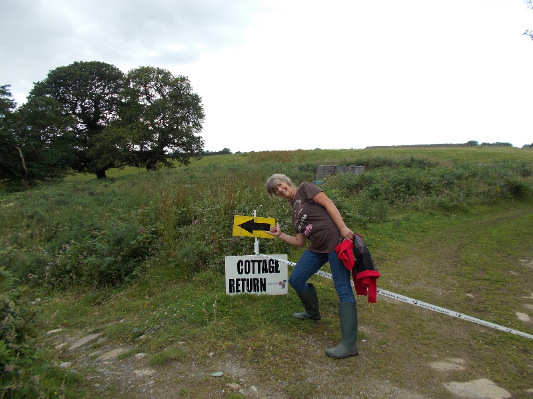 The top of Cottage Return became thicker with mud whereas the Paintball woods were improving. Shortly after I crossed the line to complete lap 4, Jayne came over to complete her 3rd, but time was running out for her. I wasn’t sure that she would complete another lap before noon and I was right. I was also not sure whether I could manage another lap. I had actually won the women’s Torchbearer but I had to keep checking the results to convince myself of that fact. 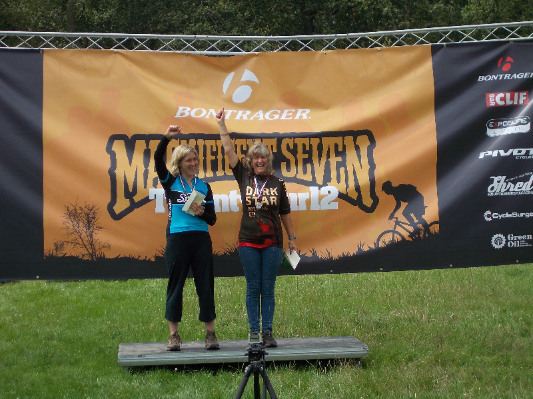 This completed a hat-trick of podiums for Team Darkstar MTB: XTM Enduro 2011, Fruita 18 Hours 2012 and Torchbearer. Huge thanks have to go to Roy for his support and encouragement. Also for his patience during the many hours of training over the years: “I can’t ride through mud”, I can’t get over that log jump”,” I’m not strong enough to climb up that…” to name but a few examples of my whining. He wont accept those lines again. He is also responsible for the great photos on this blog, taken during my last lap. The next big race for us will hopefully be in Holland at the end of September. Maybe the weather gods will be on our side by then but hey, if it rains, that shouldn’t be a problem – except for the organisers. 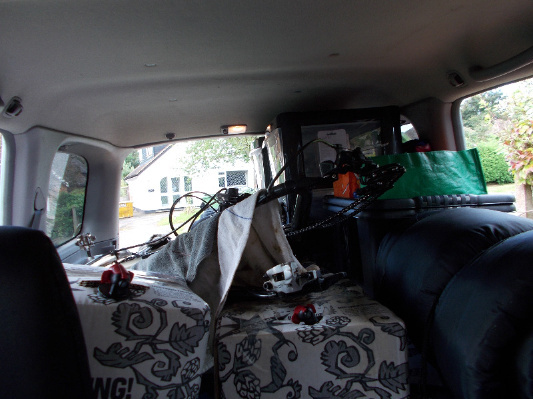 Arriving home on the Monday afternoon (after a well-deserved night in a hotel), we cleaned the race bikes. I washed off 3 pounds of mud – thankfully the hosepipe ban had just been lifted. Post script - just in case you're interested, my phone dried out and works perfectly. Phew! !